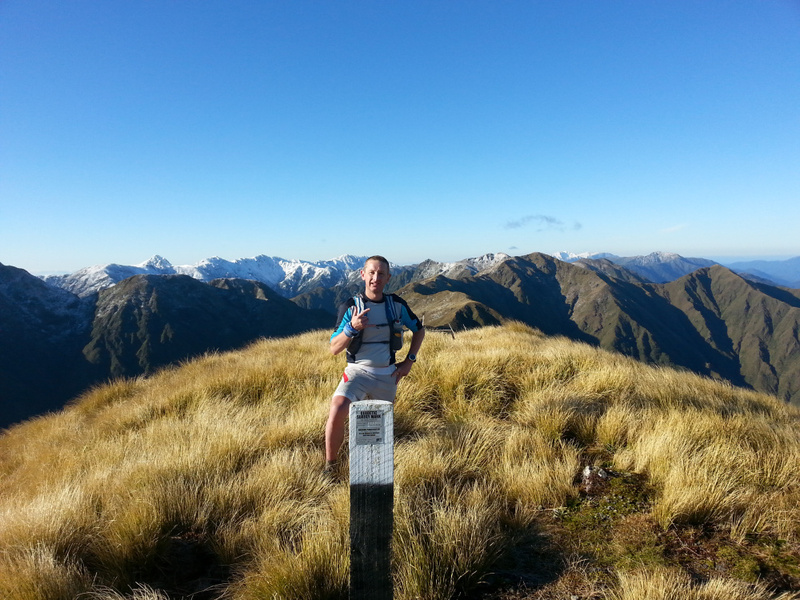 A Traverse of the Tararua Main Range has been on my bucket list for nearly as long as I have been enjoying running in our backcountry. There is so much history behind this section of the New Zealand hills, so many stories told, trips made, rescues, documentaries, books and personalities. My own interest in the range probably started in 1986, when as a diminutive 13-year-old, weighing in at 35kg I hoisted what seemed like a 20kg pack and set off from the Putara Road end in classic Tararua conditions. This was a compulsory trip for young Rathkeale lads, a three-day loop around Roaring Stag, Cow Creek to Kiriwhakapapa. It was wet, cold, miserable and I didn’t tramp again for 15 years. Interest was sparked when Grant asked for a bio and plans to go up on the Ultimate Direction website. I put in a long hoped for Traverse as a goal. That started a conversation which rapidly escalated into committing to the adventure. But with the range having notoriously poor weather, how should we plan it from the bottom of the Sth Island. In the end we booked flights, gave ourselves a two-day window and hoped for the best. Without fail, when asking some experienced locals, the best was considered to be a dying southerly and the 24-36 hours immediately post that when the wind would turn back to the North/North West. Ten days out and the long-range forecast showed exactly that for Saturday. It never changed, quite possibly the most stable forecast I have ever seen. Driving up from Wellington on Friday morning our hopes were dashed. The Southerly had plastered the Southern Crossing and Eastern Range with a heavy dumping of snow. There was Zero chance of completing our goal, but there were options. A trip through the valleys would still be possible or possibly the beginning of the main range before dropping off to the west and Otaki Forks if we were lucky. But as we pulled up to the Road end to camp it was abundantly obvious that there was no snow on the main range. The storm had stalled over the Southern and Eastern parts. 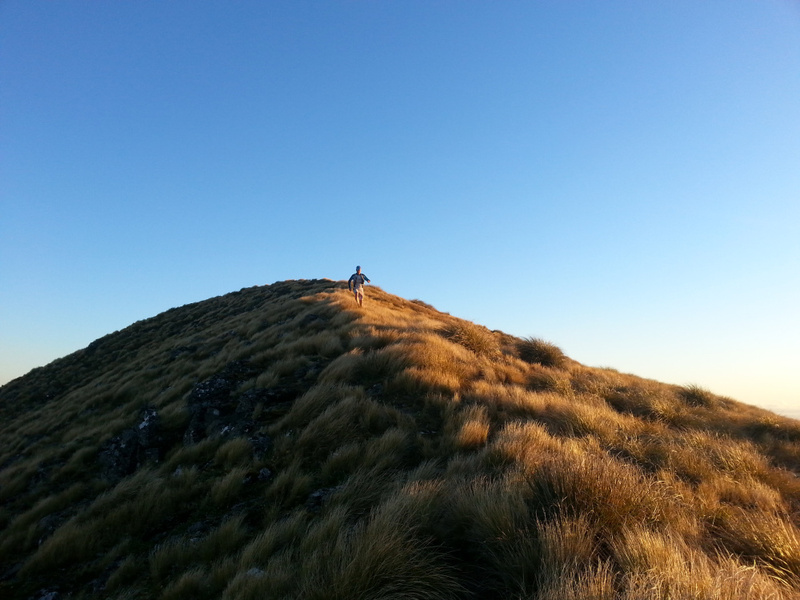 The original route started through Bryant’s Farm and up a ridge to Putara Hut, Kareti, Hines and joining the current trip at Ruapae. That was closed in 1977, but doesn’t seem any different in length based on my reading of the older trip reports. The trip was first completed in 1963 with the goal being to complete it between Friday evening and Sunday evening to be back at work on Monday. Any variation on the route was acceptable, but the Main Range is considered the hardest. Gary Goldsworthy probably set the 1st very fast time, 25 ½ hours, punctuated with 30 minute breaks (1:45 Total) at huts for fuelling. Colin Rolfe then set a long-standing time of 22:59, again with 1:15 of breaks, this was finally broken last year by Chris Swallow and Laurence Pidcock (22:12) but they unfortunately made some errors which cost them nearly 3 hours in total. So at 3:30am Grant and I set off with a variety of goals. Yes, one major goal was to run the fastest time but more of it was about exploring and seeing what the range had to offer. I had made an A3 map with the Northern section on one side and the Southern on the other and added some notation about direction, time and location for water. In the end though, the map only came out to see which of the numerous peaks was next or which it was we were currently standing on. By my count there are 39 named and 26 spot heights that you go over or immediately next to. Navigation was never an issue in the perfect conditions. Not planning on getting lost or spending time sitting down I had more or less followed Colin Rolfe’s schedule for everything beyond Dundas. Others had been quicker to that point so I worked on something in between that I figured was conservative. When added up I’d pencilled in 21:05 (67 minute below the record) and genuinely thought a 20:00 could be possible, it is, but not for me. I was somewhat surprised at Herepai to find we were already 5 minutes down on our estimate which in turn was 11 minute down on the previous best. Not concerned, we felt that getting to the far end of the range in one piece, with the ability to move well would be the key. Sunrise around the East and West Peaks meant time for photographs. In fact we took a lot of them. With Grants ability to quickly catch up he did most of the work keeping friends and family updated with our whereabouts, one of the bonuses of modern technology I guess. We arrived at Dundas some 40 minutes behind schedule which in reality was still 25 minutes up on the record, but Dundas is only 4 ½ hours into the trip. Oh well, nothing we could do about it. We continued along, never focussing on more than a peak or a hut at a time, eventually coming to the end of the 1st map (Anderson Hut), turning over and then beginning the 1nd half. Approaching halfway is always a milestone for me as I find the 2nd part of a run seems to move much quicker in my mind. There had been some wonderful views in that 1st half. 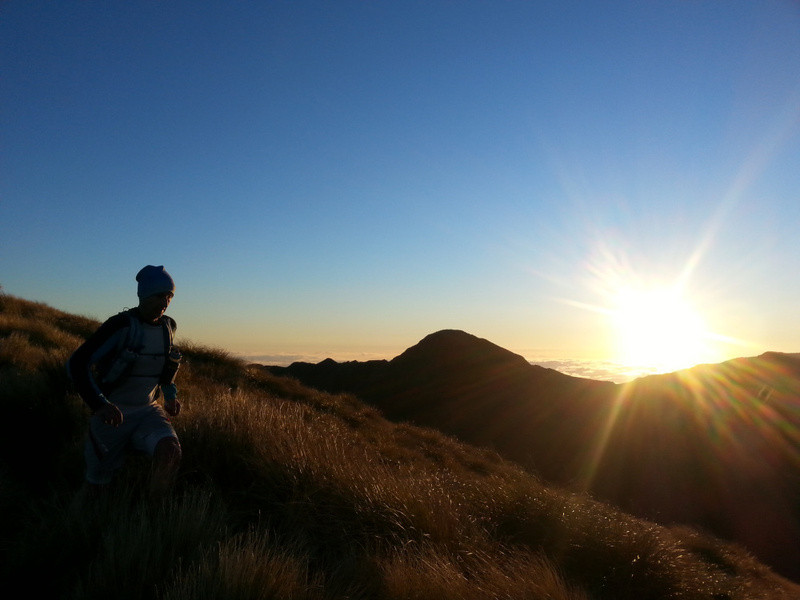 The early traverse from West Peak to Pukematawai is simply stunning. The headwaters of the glacial Park valley were gorgeous, but with a surprisingly warm day at 9:00am we were very happy to drop into the bush, top up water and douse our heads at Dracophyllum Hut. Descending off Crawford 2 Gliders shot around Junction Knob hugging the ridge as 2 trampers on the Te Araroa section rested. After having lost time early we’d actually made up small pieces here an there on the way to Maungahuka. Like so many of the 2 day reports the leg to Maungahuka over Aokaparangi is critical to success. For the longer trips this is often completed in the dark and needs to be done to make day 2 so much easier. So perhaps it is unsurprising that for a one day trip this is where I was beginning to struggle more relative to Grants pace and just like the Motatapu Adventure run he shouldered my pack for the climb, found some activities to amuse himself and left me to much on food and get to the hut in good shape. So while I began to struggle (12 hours of moving) it was obvious that everyone prior had also struggled as we were still not losing time to our estimates. Maungahuka to Kime was estimated for 2hrs 40minutes, and it looked like we could make up some time, but the excitement we had around the twin peaks of Tunui and Tuiti (and that blasted fatigue) meant we lost another 10 minutes. Grant had carried my pack up Bridge Peak again, as around here he was getting quite concerned about the record. For some reason I felt we were still good with a 30 minute lead and I knew I was still moving well even if it felt sloth like. 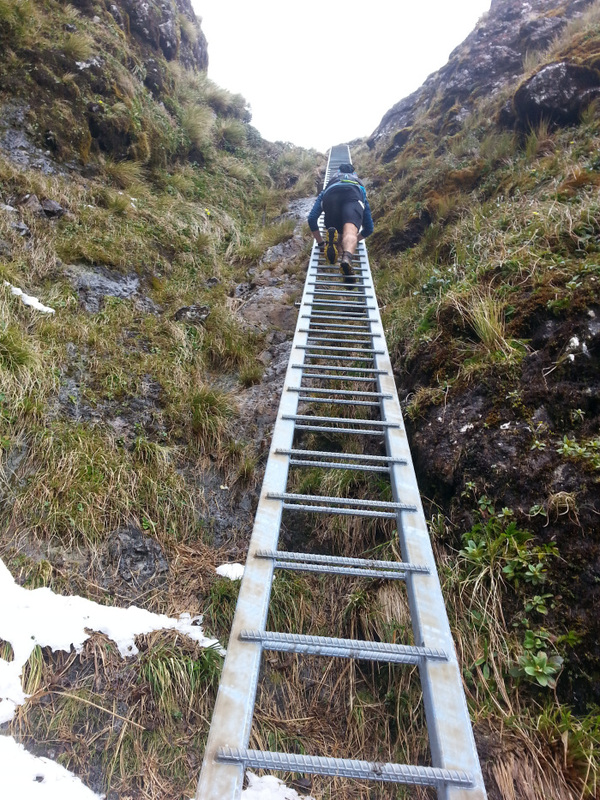 That section is something I will never forget, it seems to be skipped over in some reports, but for me the history that has gone into the placing of ropes, chains and ladders is as enthralling as the terrain itself. We arrived at Kime and our first ankle-deep, slushy snow after nearly 15 hours, about 30 minutes behind plan but 40 minutes up on the record. It was obvious many people had gone over the Southern Crossing and the unexpected fine day had reduced the snow to mostly slush but in parts it had drifted to knee-deep. The forecast had given +5 to -5 for the day, with additional 25-30kph SE winds, this wouldn’t have been enough to remove much of the snow. But we quickly got over Hector, getting a cheer from a group camping in the Field/Hector Saddle and looked incredulously down into the Snowy where another party had gone for the night. Moving over the Beehives then up and around the Dress Circle to Alpha losing only another 5 minutes to plan. It had been a stunning sunset and fitting end to our views for the day. Alpha Hut was to be our last stop so we geared up for the night and moved quickly on. Whilst Kime was considered the breaking of the back for the trip, arriving 10 minutes early to Block XVI signalled that barring disaster the record would be lowered a little further. Given my extensive experience in 1986 of having been to the junction to Herepai Hut some 3km into the trip, I had been designated the expert for the first 15 hours. Grant having run the Southern Crossing race in 2012 was likewise designated the expert for the Marchant Ridge, he can get up it in 2:30, I predicted a down trip of 4:30+ which he refused to accept. It has a somewhat fearsome reputation, but Ignorance is Bliss. Nearly the entire traverse was a long red line (new ground covered) on the map for both of us. So we just accepted whatever it was that came before us. None of it was particularly bad, the climbs are not long and the ground cover/track is what it is. We knew the Marchant would take 3 hours, so it didn’t really matter what it had, that was how long it was going to take. Down onto the Dobson Loop Track I had my one and only fall, I was happy, it was comfortable on the ground. I didn’t have to run, running made me feel sick. Grant wasn’t so happy that I was happy there. At 1:03am we popped out into the new DOC car park, only 28 minutes down on a plan that was made with no knowledge of the terrain. Greg Thurlow was possibly more excited than we were, Grant was pretty excited and I was too spent to really know what was going on. A call home to re-assure Ann that all was good and we were off back to Greg’s. Without a shadow of doubt, this is the single most satisfying run/trip/hike/race in our backcountry that I have ever completed. The history, the weather, the terrain, the support from Greg and sharing it with a mate were what made it so special, thanks guys. The time was a bonus. Other than Greg dropping us off and picking us up we were quite keen on doing this trip by ourselves. We just wanted to keep things simple. So we carried everything you’d need for a day out and perhaps an uncomfortable night. 1x GOOD Shell Layer. Not the rubbish seem sealed that is suitable for passing compulsory gear checks but in my case Gortex Jacket and Pants. Some first aid, food, lights and the ability to light a fire. The table below shows our Planned and Actual times for various segments compared to others who have gone quickly across the main range. Hopefully that will be of use for others in the future. Some points to note. Swallow/Pidcock moved exceptionally fast and their times suggest they can go well under 20 hours, I think that we were more than an hour behind them by Dundas alone. Their split to Nichols includes an additional 20 minutes out to Kelleher.